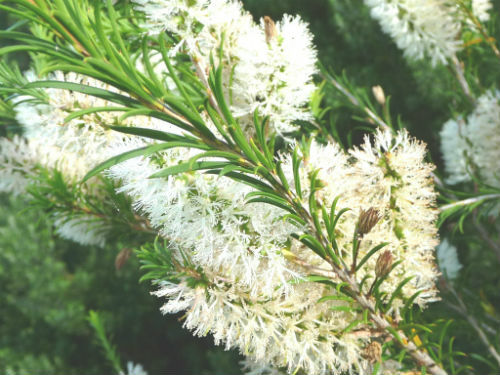 Melaleuca armillaris, Bracelet Honey-myrtle, grows into a tall spreading shrub or small tree. The leaves are light green and narrow. In spring and summer plants become covered with white bottlebrush-like flowers. They attract a range of insects. The dense foliage provides nesting opportunities for small native birds. Pruning improves foliage density. M. armillaris is a popular garden subject and has proved to be hardy and free flowering. The Bracelet Honey-myrtle is an excellent hedge plant. M. armillaris is found on the coast and tablelands area of NSW, Victoria, Tasmania and South Australia. The species name comes from the Latin: armilla, meaning a bracelet and refers to the appearance of the cylindrical fruits on the branches. This feature has also given rise to the common name.